THE Tip O’Neill Primary Schools Competition has been announced today and invites local schoolchildren to get creative. All primary school pupils in Inishowen are eligible to enter the competition and may submit either a piece of art or a poem. The works can either be on the subject of the Donegal Diaspora or Tip O’Neill. Entrants will have a chance to win prizes for themselves and their schools including: 1st Prize – Book Token €100 (School Book Token €150); 2nd Prize – Book Token €75 (School Book Token €125) and 3rd Prize – Book Token €50 (School Book Token €100). Highly commended entrants will also receive book tokens worth €25. 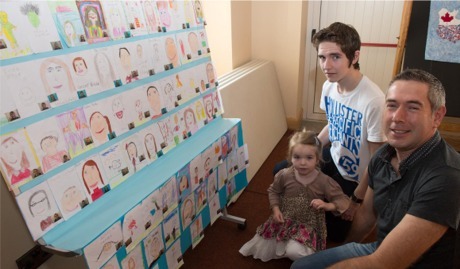 Visitors view entries from last year's Tip O'Neill Schools Competition at the Sliabh Sneacht Centre in Drumfries. Cultural Services staff of Donegal County Council will adjudicate the entries. The closing date is Friday, June 24, 2016 and students may drop their completed entries into Buncrana Community Library, Carndonagh Community Library or Moville Branch Library. Buncrana Town Council and Donegal County Council launched the competition in 2012 and since then 325 primary school students have taken part, winning €2, 400 worth of prize money for themselves and their schools. Members of Tip O’Neill’s family will present this year's prizes as part of The Tip O’Neill Diaspora Award event on Friday, September 23, 2016.